It looks like it'll be a moody and atmospheric movie. Saoirse Ronan needs a good role that lives up to her performance in HANNA and after going mainstream with THE HOST and this looks to be that role. 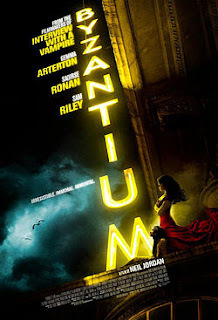 BYZANTIUM comes out June 28, 2013, it is directed by Neil Jordan, and stars Saoirse Ronan, Gemma Arterton, and Caleb Landry Jones.